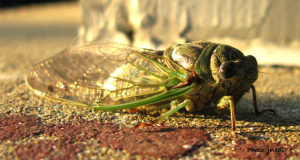 When we find at an adult cicada in nature, we almost never find substances smeared on the wing surface, particles attached to the wing or microorganisms growing on the wings. However wing fouling is a common problem for many man-made objects. Airplanes, helicopters, wind turbines and other structures exposed to moving air accumulate aeroplankton and airborne particles. Fouling is difficult to prevent. Yet cicadas wings do not suffer from fouling. Why?